I’d like to end this years primary election 2014 series with a behind the scenes look. This phone was taking at the Brian Schatz headquarters but its very similar at all places. There are news teams (you can see on on the far right) set up at strategic points, tv sets around the rooms with various news coverages, food of varying types and the campaign organizers. The organizers coordinate when the candidate appears and also the media request as well as works with the volunteers. As TV live shots are about to be made they hand out campaign signs and instruct people were to stand during the live interviews. It’s actually fascinating and I’ve found I can learn a lot more about a candidate by seeing who is there to support them and how they and their staffs act whether they win or lose. 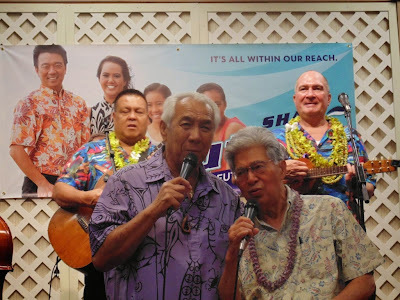 One of the non candidate highlights at this years primary election was the moment when Danny Kaleikini took the stage with Daniel Akaka and sang a song for the audience at Shan Tsutsui’s campaign headquarters. Kaleikiki has performed at the Kahala Mandarin Orintal hotel for over 30 years and was named “Hawaii’s Ambassador of Aloha” in 1988 by then Governor John Waihee. You may have also seen him in Hawaii Five-0. Daniel Akaka was Hawaii’s United States Senator from 1990 to his retirement in 2013. Prior to that he spent 14 years in the U.S. House of Representatives. 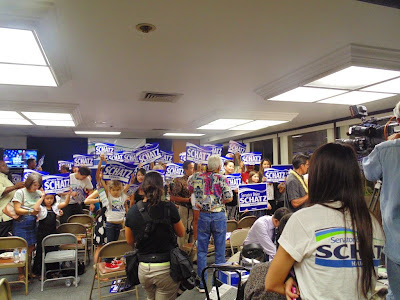 Continuing our look back the the 2014 primary election in Hawaii. 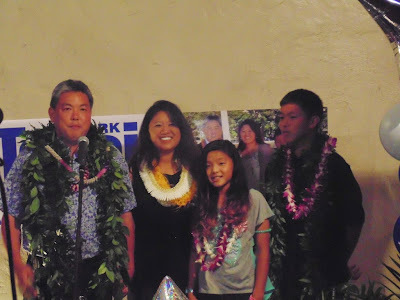 Here is Mark Takai and his family celebrating his win in the Democratic primary for Hawaii’s 1st congressional seat in the house of representatives. His wife Sami was a classmate of mine at Moanalua High School. Takai is a graduate from Pearl City High School and the University of Hawaii. He has been serving in the state House of Representatives from 1994 representing Aiea. He is also a First Lieutenant in the Hawaii National Guard. He will be challenging Republican nominee Charles Dijou for the congressional seat in the November general election.